Music administration, release management, promotion, A&R and distribution under one roof. Finally. Navigating the complex industry landscape today isn't just about producing great work. It's about all the hard work that surrounds it, and your ability to react quickly. More than another product, you need a platform to manage it. Take some time to decide which version is right for your company, then get Team Edition or Business Edition for as little as $20/month. Tired of single-use apps? Magnetracks brings it all together. Manage and maintain your licensing, publishing and distribution deals. Let Magnetracks remind you when key dates approach, and save all your supporting documents in one place. Share tracks with contributors, publishers or catalog administrators, including metadata and even artwork. Promote your releases directly through Facebook, Twitter and other social platforms. Deliver by FTP, email, and other file delivery services. With a beautiful drag-and-drop visual scheduler, Magnetracks gives you straightforward control over tasks assigned, production notes, etc. Magnetracks is pre-loaded with templates for projects, catalogs, task lists and emails so you can get in and get out without a bunch of mindnumbing (and soul-rotting) data entry. Easy to use import and export tools allow you to move your metadata, project info, and more in a variety of industry-standard formats. Edit and create new fields, forms and lists. Trigger email notifications based on the way you work. Magnetracks reflects the dynamic industry in which we work. Understand your business in order to grow your business. By capturing all aspects of your music catalog, clients, pitch activity, licensing, royalties and projects in one system, you'd think the biggest benefit would be the huge time-savings. 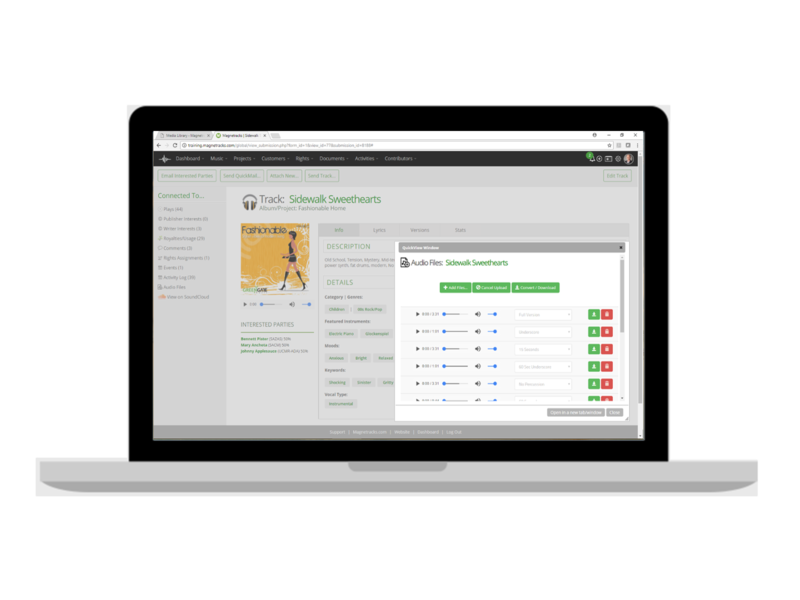 But with Magnetracks, you also get insights that can drive your promotional and production decisions to produce music that is more targeted and more in-demand. Magnetracks' point-and-click, totally configurable dashboards let you respond to trends, identify opportunities, and shed light on stuff that no spreadsheet ever could!